Lacking in meaningful challenge, Murdered fails to deliver on its promising premise at every step. Detective games have always been difficult to pull off. Mysteries are about fluidity of meaning—intuition, third options, non-binary solutions to binary-seeming problems. Most games are binary by their nature; you're right or wrong, you win or you lose. In this regard, Murdered: Soul Suspect sets a high bar for itself. It's an adventure game about a detective, Ronan O'Connor, who is killed in the game's opening moments. As a ghost, he uses spectral powers to investigate crime scenes in the hopes of solving his own murder. The challenge of creating an interactive mystery is augmented by a protagonist who can possess people and listen to their thoughts, walk through walls, and touch objects to see their history. It's a great premise, but one that Murdered: Soul Suspect is singularly incapable of living up to. Not only does it fail to present a satisfying mystery to solve, but its ghostly high concept hinders the experience rather than enhancing it. You can listen to everybody's thoughts, yes, but few characters have more than two. Here, 'thoughts' are looping non sequiturs that make the world less believable, not more. Then you realise that the majority of the characters in the game's small open-world setting—downtown Salem, Massachusetts—are both physically and mentally identical. A whole city of people thinking the same thought about dead cops in the same voice. You can use a poltergeist ability to trigger electronic items in the environment—phones, coffee machines and so on. These are used to create distractions for an ally during certain escape sequences, but otherwise they don't do anything. You can cause a printer to start spewing paper right next to an on-duty policeman and it'll have no effect unless you're at the exact point in the game where he's scripted to respond. There's nothing dynamic about the system at all—you can play at being a ghost if you like, but the world is deader than you are. The fiction establishes that ghosts need to be allowed into a building before they can move around freely, and this provides a reason to limit your ability to walk through walls. It's a reasonable restriction, and the presence of spectral boundaries—artifacts from the past, like upturned 17th-century carts—make sense as obstacles and add interesting detail to otherwise gloomy street scenes. But this restriction is incorporated inconsistently, particularly in outdoor areas. If the game needs to turn you away, it will—normally with a fade to black and a curt refusal from its protagonist. Graceless design like this might be acceptable in a game with more substance elsewhere, but Murdered doesn't have it. The vast majority of your time will be spent clicking on collectible items while walking to the next investigation scene. Newspaper clippings and hidden notes provide background information on Ronan, his killer, and the world they occupy, but none of this information can be used to further your investigation. Like the historical plaques that have been scattered around the town for you to collect, they're there to pad out a full price game with no replay value that can be comfortably finished in six hours. There are a handful of stealth encounters where you have to evade patrolling demons, but these are undercooked. Enemies will barely respond to you as long as you're behind them, from which position you can quickly execute them in a quicktime event. Even if you're being chased, it's often easier to just run to the next checkpoint than to try to hide in one of the provided concealment points. My biggest disappointment with the game, however, is the investigations themselves. In these sequences you must search for clues, access memories, and use this information to trigger actions or recollections from the people you possess. Then, you're quizzed on what you know: by selecting the most relevant clues you've uncovered, you unlock the next cutscene and the game continues. There is no challenge to these sequences: as long as you click on everything and pick the most obvious answers to every question then you'll never go wrong. Whenever I encountered problems, it was normally because of misleading descriptions or arbitrary distinctions between equally viable answers. If you're asked to identify a sound, and you can hear a branch cracking, do you choose 'branch' or 'crack'? You have both options. They're both right, but the game will only accept one of them. Murdered's didactic deduction puzzles completely fail to account for ambiguity in language or intent, key factors in any process of investigation. 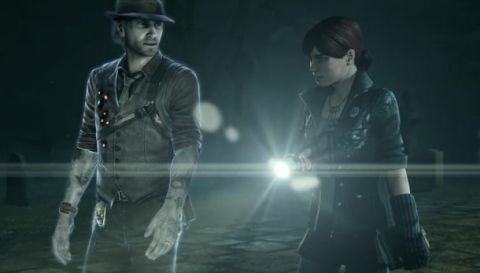 It's difficult not to get ahead of Murdered: Soul Suspect's flatlining difficulty curve. I'd figured out the killer's motive—an ostensibly unsolvable, game-spanning mystery—by about an hour and a half in, just as anybody who pays attention will be able to do. The rest of the game was a matter of pushing whichever buttons I was asked to push until Ronan finally figured it out for himself. He might be haunting Salem, but I felt like I was haunting him —floating slightly above everything that happened, waiting for a chance to actually influence the game or deduce anything meaningful. Late in the game, when given all the information to arrive at a conclusion that I'd reached hours before, it still took a visit to a museum full of directly relevant clues to move the plot along. An actual museum! A Sherlock Holmes story where the great detective lives next to a giant building called Moriarty's Murderdome would not be a mystery, and neither is this. To the game's credit the plot gets more interesting at the very end, but by this point your interaction is limited to running and trial-and-error quicktime events. There's also some decent acting, but it's bogged down by rote characterisation and a willingness to wander into cliche. This is a game about a maverick ghost cop in a fedora with an earnest brother-in-law, a dead wife (complete with heavenward "nooo! "), a professional rival who just won't get off his back and a feisty teen sidekick. It's not James Ellroy. Hell, it's barely CSI: Salem. It's a pilot episode that won't get picked up for a full season. The PC version is sub-par: it's never a good sign when a game asks you to 'press start' on a platform with no start key. It's been designed for a gamepad and struggles to translate this experience to keyboard and mouse. Menus are particularly bad, and I lasted about half an hour before switching over to an Xbox controller. Bugs lurk at the fringe: on one occasion I needed to reload a checkpoint to resolve a scripting issue, and I managed to fall off the edge of the world while exploring normally. There's a good game to be made out of Murdered's ambitious premise, but this isn't it. As a cheaper game it might have passed as a curio, but I'm a little horrified that something with this many transparent flaws and this little substance is being pitched at full price. Sprinkle salt on your doorstep, keep the light on, and avoid.